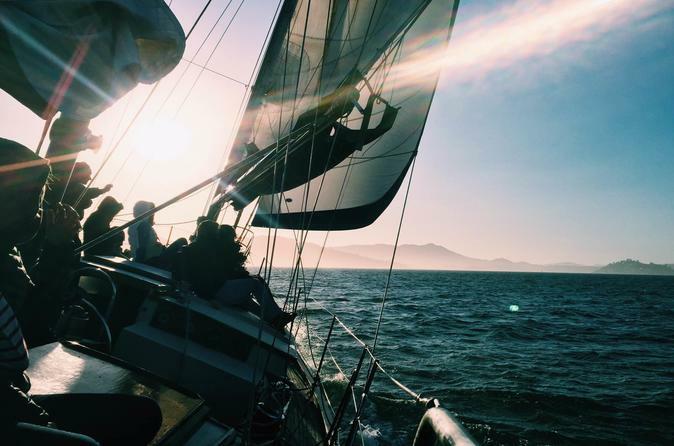 Hop on board a traditional sailboat to experience the San Francisco Bay! You will have the option to sail towards the Golden Gate Bridge to soak in its grandeur or head over to the Bay Bridge and view the city skyline. The boat departs from Pier 39, one of San Francisco's most popular features, and a central location on the bay to experience the amazing views right off the bat. You will meet your captain and first mate at Pier 39 15 minutes before your scheduled departure time. They will check you in and then make you comfortable on Between The Sheets, our lovely Islander 36. You will motor out of the dock, but once out on the Bay, your crew will raise the sails! You will sail past Alcatraz and Angel Island, get a great view of the Bay Bridge, take in the beautiful green landscape of Marin and the picturesque city of Sausalito, sail parallel to the Golden Gate for some great photo opportunities, and then return to views of the San Francisco waterfront before docking again at Pier 39. You are welcome to bring any food or drink aboard to enjoy while our friendly captains will be happy to answer any questions you might have during your tour, or you can feel free to just sit back, relax, and enjoy our incredible Bay. This tour is a great way to relax and see the Bay from a different perspective!